The best science fiction films don’t create fantastical worlds inhabited by supernaturally powerful beings. They don’t have to be big spectacles that fill an oversized IMAX screen with bombast. A good science fiction story gives us a world just different enough from our own that it feels grounded and even relatable, often with a big Message applicable to our own times. The heroes are people who rise to the occasion and overcome, by the sheer force of will we find within ourselves when confronted. It makes us think not just about what we saw, but what we experienced and even felt. Is the new Netflix film Extinction great sci-fi? It’s certainly trying its hardest to be, to the point that you can admire its ambition and really see What They Did There. There are big ideas that come to fruition in ways that the viewer may not expect. But while the destination is a fairly satisfying one, the road there is a bit bumpier than it needs to be. Pete (Michael Pena) is a working-class family man haunted by dreams—visions?—of invaders from the skies raining death and destruction on the planet. 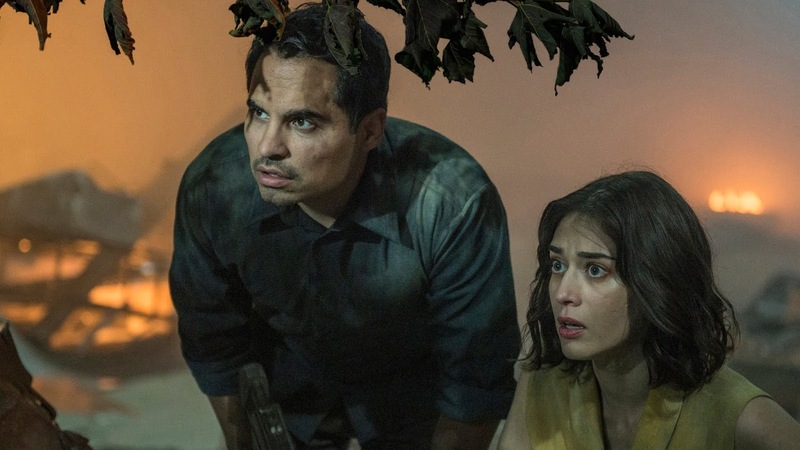 When the invaders arrive and the nightmares start coming true, Pete must find a way keep his wife (Lizzy Caplan, who having starred in Cloverfield has a bit of experience with this stuff) and daughters safe. The first two-thirds of the film feel a bit disjointed, like they could have worked better as two entirely different films, and with a bit of fleshing out of ideas perhaps they could have. But what is a good sci-fi story without its customary Big Reveal in act 3? 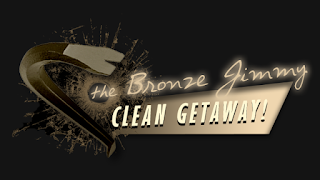 In the interest of keeping things spoiler-free, know that your perseverance through the bombardment of ideas and details earlier in the films will be rewarded, assuming you're still willing to let the film do so. Director Ben Young and writers Spenser Cohen and Brad Caleb Kane have clearly found inspiration in some of the great sci-fi stories of our time (to reveal specifics would be to reveal too much.) For the most part Extinction feels more like a homage than a rip-off. But what the film lacks that the films that inspire it had is balance. Ideas like the ones presented in Extinction need a bit more work and time to develop than they're given here, which results in a brisk 100-minute film threatened by the weight of its top-heaviness. The balance of set-up to pay-off is a difficult but important thing to get right in films like this, and while the film's last third does manage to address and suitably resolve most of the questions it raises, it feels at times like things came together a bit more simply than the presentation would have you believe is possible. This allows some of the underlying ideas to feel unresolved, or swallowed whole by the Message. You may like the ending of Extinction, but you might not like how you feel about it. 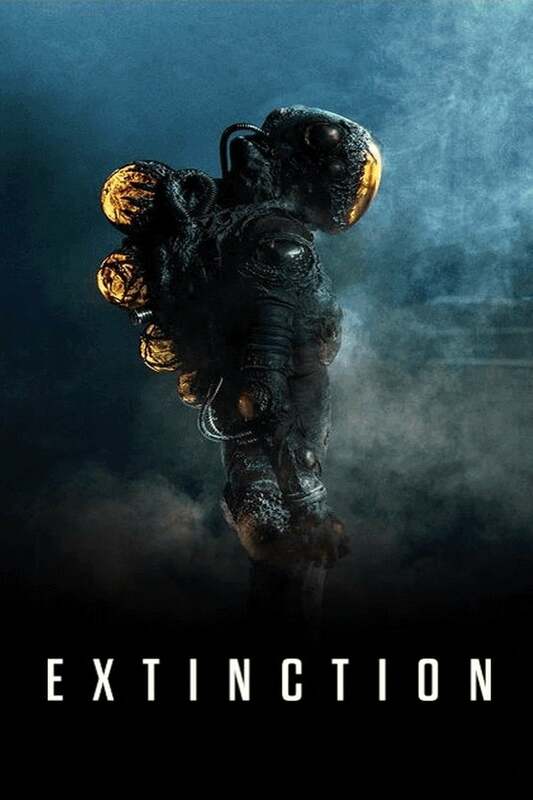 Extinction may not be the next sci-fi classic, but it still manages to be both admirably ambitious and an overall enjoyable way to spend an hour and forty minutes. Netflix original films are still stigmatized despite the high quality of most of their content and a favorable ratio of good to bad. After all, if it's so great, why isn't it playing in theaters? But for its ambition and scope and yes, even the occasional gunfight or explosion, Extinction feels like the kind of film that plays better on a small screen than your local multiplex. 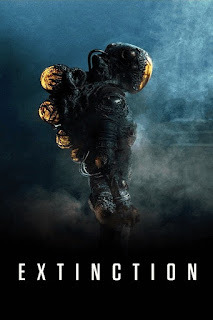 It gives you a lot to think about, maybe at times too much, and it meanders a bit on its journey, but Extinction is good old-fashioned sci-fi that packs a surprisingly effective emotional punch.